Next, I'm going to read a list of problems facing the country. For each one, please tell me if you personally worry about this problem a great deal, a fair amount, only a little or not at all? How much do you personally worry about the availability and affordability of energy? Do you think [...] is doing a good job or a poor job in handling each of the following issues as president? How about improving the nation's energy policy? Generally speaking, do you think nuclear power plants are safe or not safe? ^Asked of a half sample; # WORDING: Generally speaking, do you think nuclear power plants in the United States are safe? We'd like to ask you about proposals to dramatically reduce the use of fossil fuels such as gas, oil and coal in the U.S. within the next 10 or 20 years, in order to reduce greenhouse gas emissions. Would you strongly favor, favor, oppose or strongly oppose establishing policies aimed at achieving this? Next, we'd like to know how you feel about the state of the nation in each of the following areas. For each one, please say whether you are -- very satisfied, somewhat satisfied, somewhat dissatisfied or very dissatisfied. If you don't have enough information about a particular subject to rate it, just say so. How about -- the nation's energy policies? Now, thinking about the cost of gasoline, do you think the current rise in gas prices represents -- [ROTATED: a temporary fluctuation in prices, or a more permanent change in prices]? Have recent price increases in gasoline caused any financial hardship for you or your household? Will the price of gas cause you to drive less than you might have otherwise this summer, or not? How serious would you say the energy situation is in the United States -- very serious, fairly serious or not at all serious? 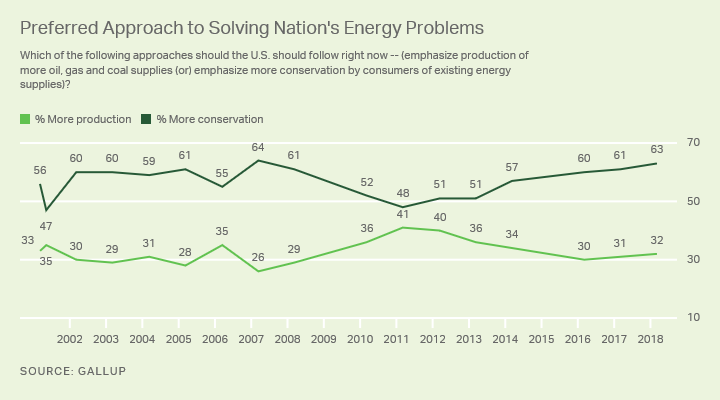 Which of the following approaches to solving the nation's energy problems do you think the U.S. should follow right now -- [ROTATED: emphasize production of more oil, gas and coal supplies (or) emphasize more conservation by consumers of existing energy supplies]? Which of the following approaches to solving the nation's energy problems do you think the U.S. should follow right now -- [ROTATED: emphasize production of more oil, gas and coal supplies (or) emphasize the development of alternative energy such as wind and solar power]? Do you think that the United States is or is not likely to face a critical energy shortage during the next five years? How closely are you following the news about the proposed building of the Keystone XL pipeline, which would carry oil from Canada to Texas -- very closely, somewhat closely, not too closely or not at all? Overall, do you think ... is or is not doing enough to solve the country's energy problems? Which comes closer to your view about increasing the number of nuclear power plants in the country -- [ROTATED: nuclear power is necessary to help solve the country's current energy problems (or) the dangers of nuclear power are too great, even if it would help solve the country's current energy problems]? Do you think the Arctic National Wildlife Refuge in Alaska should or should not be opened up for oil exploration? Do you favor or oppose increasing offshore drilling for oil and gas in U.S. coastal areas? (Asked of those who oppose increased offshore drilling) Do you oppose any drilling for oil and gas in U.S. coastal areas, or do you only oppose increased drilling for oil and gas beyond what is currently being done? Have you, personally, taken any steps this year to make your home more energy efficient, or not? Did you take steps to make your home more energy efficient -- [ROTATED: mostly to save money (or) mostly to improve the environment]? Would you prefer the government to increase, decrease or not change the financial support and incentives it gives for producing energy from ... ? Please tell me whether you think each of the following deserves a great deal of blame, some blame, not much blame or no blame at all for the country's current energy problems. How about -- [RANDOM ORDER]? Who do you think should have the primary responsibility for spending money to develop alternative sources of energy to gasoline -- [ROTATED: the government, the automobile companies (or) energy or oil companies]? 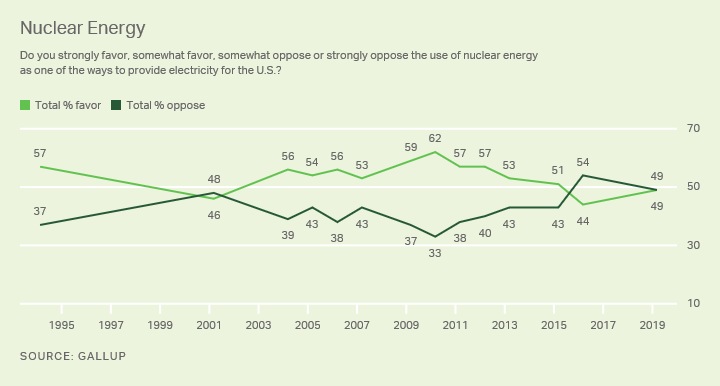 Overall, would you strongly favor, somewhat favor, somewhat oppose or strongly oppose the construction of a nuclear energy plant in your area as one of the ways to provide electricity for the U.S.? Now, thinking about the cost and availability of electricity, gasoline, natural gas and other forms of energy, would you say the country -- [ROTATED: is in a state of crisis, has major problems, has minor problems (or) has no problems at all]? Looking ahead, do you think -- [ROTATED: the global supply of oil will always be able to keep up with the demand for oil around the world, (or do you think) the world will eventually run short of oil sometime in the future]? Just your best guess, how many years do you think it will be before the world runs short of oil? Just your best guess, how likely is it that terrorists will attempt a major attack against oil producing facilities or oil supplies somewhere in the world within the next 12 months -- very likely, somewhat likely, not too likely or not at all likely?